The process for creating spirits in Vinsight will vary depending on the physical processes involved in creating the particular spirit. 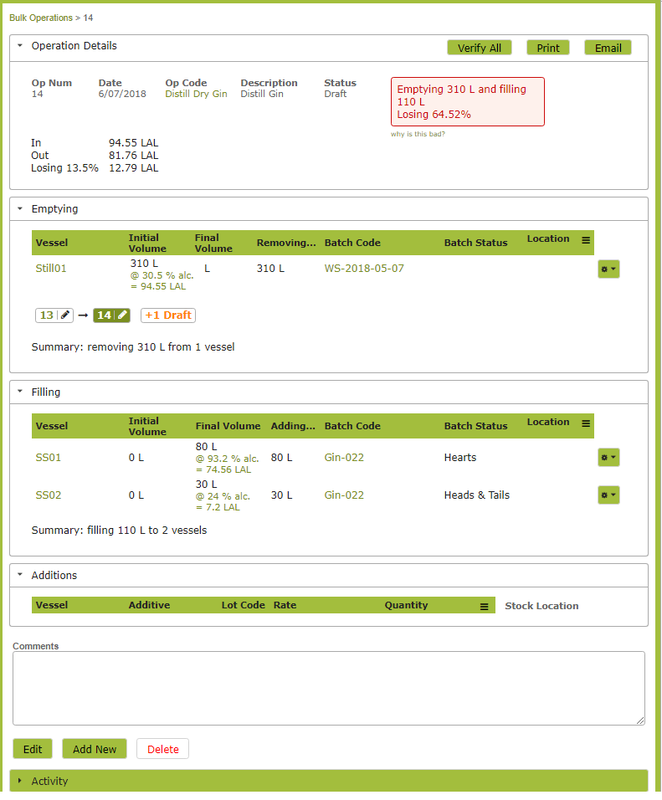 In this document we will discuss the various processes (operations) available within Vinsight. We outline an example process of making a gin. In the following example we use the features in the ‘Make’ part of the menu to purchase bulk spirit and distill gin. 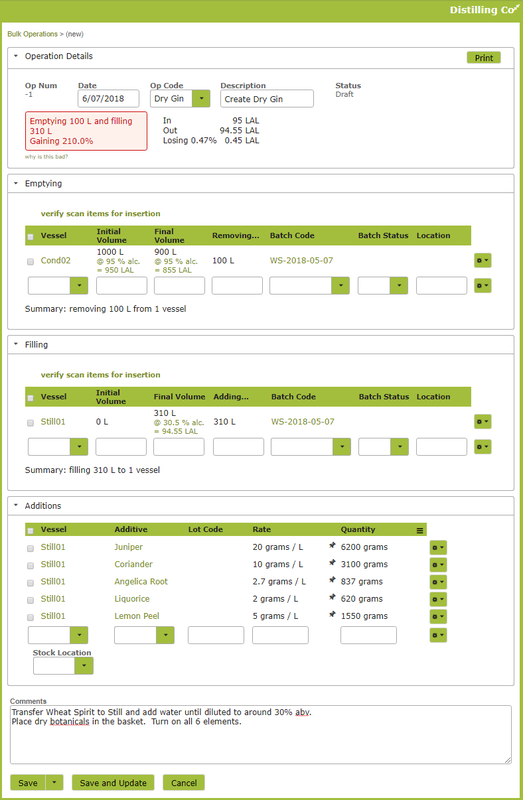 This example should give you some idea as to how to set up the processes for your own distillery. 1. Receive purchased spirit into tank. If you purchase spirit in bulk, you can track these purchases into your product. Use a ‘Receival’ Operation to import the purchased product into tanks. 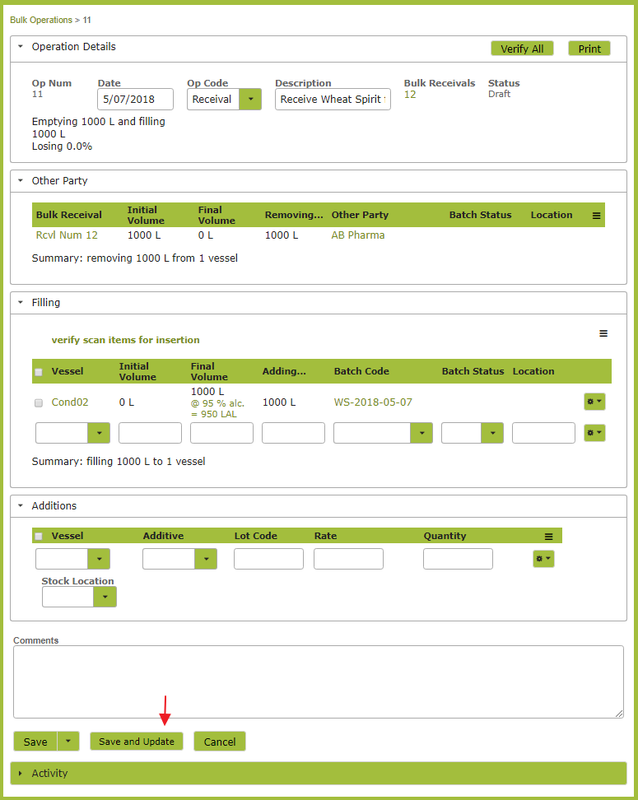 This ‘Receival’ can be connected to the relevant purchase order. Go to Make > Bulk Receival and click ‘New’ to create a new Bulk Receival. Ensure you complete the Blend Composition information. If you are missing the relevant ‘Variety’ from the Variety drop-down list, contact Vinsight Support (support@vinsight.net). 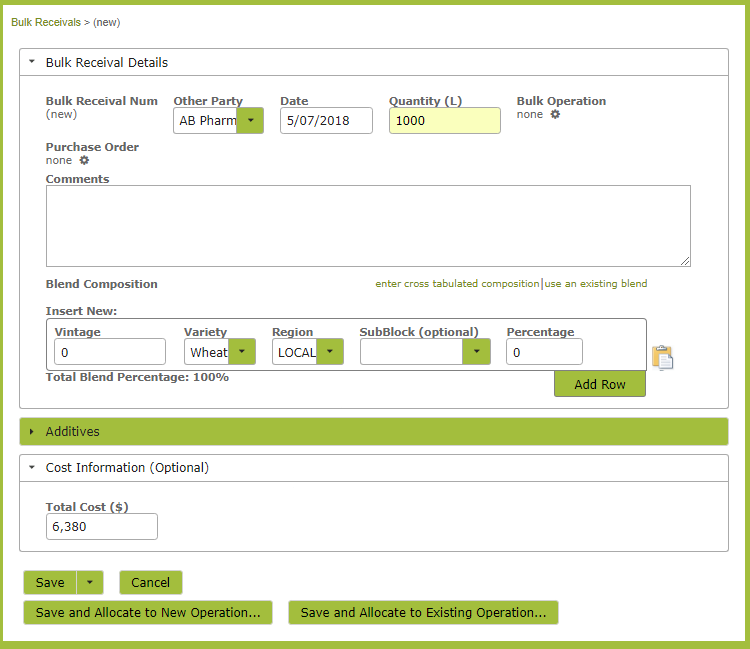 Create the Bulk Receival and click “Save and Allocate to New Operation”. This will bring up the following form, which allows you to put the spirit into a particular tank. Ensure that you insert your litres of alcohol (LAL) figures in the ‘Final Volume’ area. If this option does not appear to be available, check with Vinsight Support (support@vinsight.net) that your Alcohol Per Volume plug in has been enabled. Clicking ‘Save’ will create a draft operation. To physically move the product into tank, you need to click ‘Save and Update’. 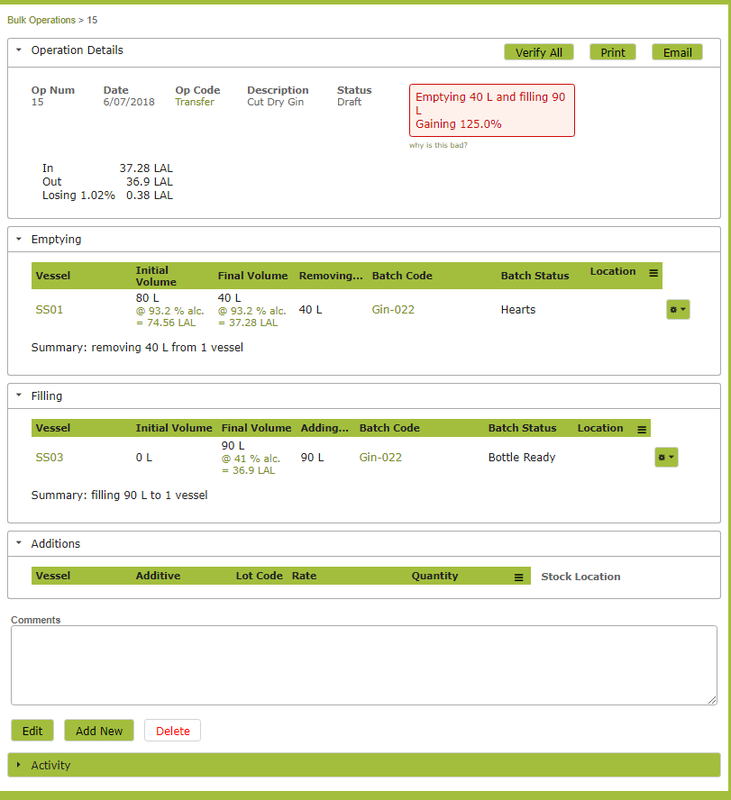 While you can use the default operations such as ‘Transfer’, ‘Addition’, ‘Create Batch’ to create blends, if you are performing a process that has repeated ingredients or instructions, it is worth taking the time to set up some custom operations that incorporate those instructions and ingredients. As the operation we are demonstrating here involves transferring spirit out of tank and into a still, the Operation Group will be Transfer. Once you have the recipe set up you can use it any time you create that product. You will not have to go through this process again, unless you are changing an existing recipe or adding a new one. You will notice some information / warnings appear at the at the top of the page. The second part show that you started with 95 litres of alcohol and ended up with 94.55 litres. As this loss of 0.47% is within the allowable parameters, this information is not highlighted in red. While you can save the operation with these warnings, when you try to ‘Update’ and actually move the product, Vinsight will require you to provide a reason for the variance. Here, you would just record that the variance was caused by an addition (water). Finally, in our gin example, we will want to record the distillation of the spirit. 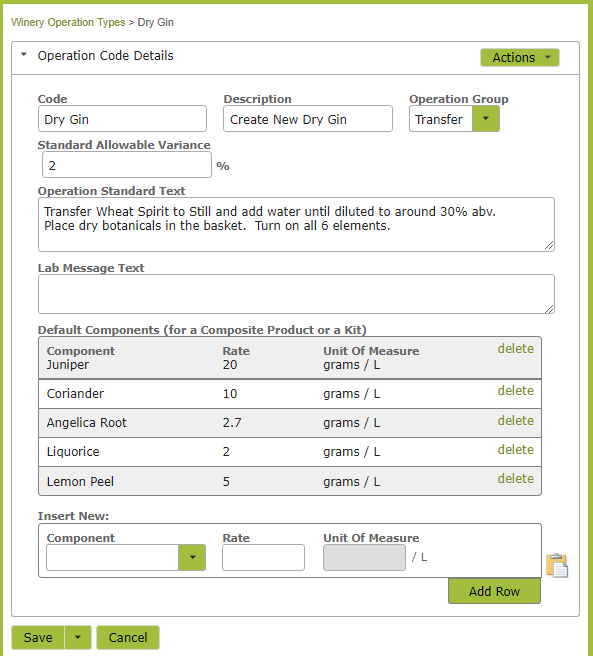 In the following example we have created a ‘Distill Dry Gin’ Operation Type, before creating the operation itself. If there were no standard instructions you wanted to include, a ‘Transfer’ Op Code would achieve the same thing.